Choice can be a powerful tool. Give a consumer the power of choice and they just might become a repeat customer or an evangelist. Case in point, the Nintendo DS. It’s the hottest selling videogame handheld. Why? Well simply put, a lot of people buy them. In fact, a lot of people buy more than one. They buy two or three. Why? Because Nintendo offers consumers the choice of their favorite color. Buyers have the choice of white, red, pink, gold, and other colors. This approach to offering consumers choice has been effectively used by other companies too. Apple with their iPods is another example. But choice on the web is different. The more choices you give to your website visitor, in terms of links and navigation, doesn’t necessarily translate into a happier experience. On the contrary, it often leads to confusion and frustration. The next time you’re writing an article or email, stick with one to two action points. Use one video on a landing page, not three. 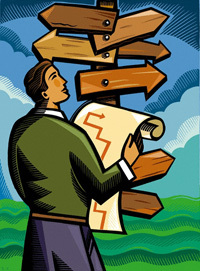 Think of your site or email as a path. You want your visitor to walk the path you layout for them. But if the visitor comes to a junction where they have a choice of taking one of 4 splits, they’ll become uncertain about what they should do. Guide your visitor down one path with zero splits. Then there are people who claim that you should use only every day words, 50-cent words. Why? Because big five-dollar words alienate customers and sound elitist. There’s not just one rule to follow. You can’t use big words or every day words and expect great results. It just doesn’t happen like that. You have to tailor your wording to your target audience. If your target audience is highly educated and love and understand industry buzz words, then use those five-dollar words. If your target audience is your every day Joe, then go with simple words. The only magic formula is to know your target audience. 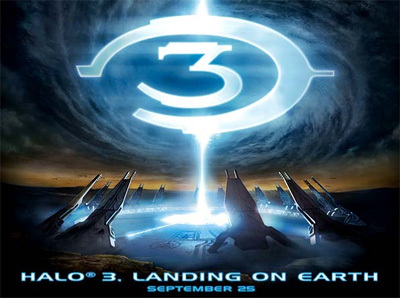 Halo 3 Believe: an amazing marketing campaign! Videogame fans around America, including myself, are waiting with bated breathe for September 25. That’s when the most anticipated videogame in history will be released – Halo 3. The videogame has already broke records within the industry by officially becoming the largest selling preorder title in history. What’s the cause of all this commotion? Well, one thing is for sure, the two previous games in the trilogy rock! They have an incredible story line and intense action. Quite simply, they’re great products. But there is something more to it. The genius marketers are also responsible for the hype. One way they do this is by strategizing when to release teaser trailers for the game to stir up the fans. Another way is by brainstorming new ways to generate hype and buzz – which they have done very well. Take their latest project, the Halo 3 Believe campaign. This is one of the best, if not the best, buzz generating websites I have ever seen! The team commissioned artists to create a huge, physical, 3-D diorama of a battle that will take place in the upcoming game. The diorama is incredibly detailed and beautifully crafted and painted. Next, they used a video camera and recorded a walk through of the diorama. Finally, they created a website, uploaded the video, added some clickable links and created something that is breathtaking and very much buzz worthy. They add testimonials from live actors, put human emotion into those testimonials, and created a mini plot for the site. All of these elements together create a sense that the battle was real, that it really happened. It causes fans to become emotionally attached to the characters of the game. It creates buzz that gets spread through blogs and forums. It gets people excited. It sells games. Experience the website for yourself by clicking here! I wonder if the marketers had a hard time convincing the higher-ups to jump on board this idea. I mean think about it, it had to be a hard sell. I can imagine the managers looking confused saying, “You want to spend twenty thousands dollars to create an actual model of a videogame?” That’s an uncommon idea. But all of us marketers should know, it’s the uncommon ideas that tend to generate the biggest response. Many small businesses mistakenly think that word-of-mouth marketing is only possible by the big boys of business. The truth is that word-of-mouth is one of the primary methods of marketing that small businesses become successful. That amazing mom-and-pop restaurant downtown didn’t become famous with direct marketing pieces (although that helps too)! Super serve your current customers. Do something unexpected that will impress your clients. This can be small things like having a cup of hot chocolate, coffee, or tea ready for them in the waiting room. Send a handwritten thank-you note to a select list of customers once a week is a great idea. By paying extra attention to your customers, they’ll be impressed. Impressed customers are more likely to tell their friends of their great experience. And, if you think these two ideas are to small to make any real impact, consider this: sometimes it’s the smallest things that have the greatest impact. Remember when marketing used to be fun? 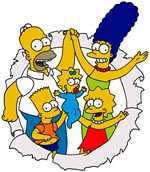 The marketing team for The Simpsons movie remembers. They’ve converted 7-11 stores into Kwik-E Marts, let towns compete to host the movie premier, created a website that will let you upload a photo to “simpsonize” yourself, and painted a 180 ft. Homer next to one of Europe’s landmarks. As a result of the team’s focus on fun, their marketing efforts have gone viral and have got coverage from the national media. Remember to incorporate fun into your next viral campaign. Thanks Piaras for letting me know about this! McDonald’s viral video: Two thumbs up! Take a look at this hilarious rap video created by two regular Joes. It went viral over the Internet (via YouTube) and got McDonald’s attention. Now McDonald’s is airing it, unedited slightly edited, on national television. Say hello to citizen marketing! Great move by the McDonald’s marketing team. Now I can’t stop thinking about the nugget rap! Hat tip to Virginia over at Brains on Fire for leading me to the video. Which Wich, the unique sandwich chain, has made a gutsy but brilliant move. The chain is promoting a blogger, Chris Thomas of Pour Out, who has vowed to eat and critique all of its 51 sandwiches. What’s interesting is that Chris decided to do this on his own. When the employees at his local Which Wich noticed he was coming in every day, Chris mentioned that he was blogging about the experience. To make the long story short, someone (possibly the district manager) decided to promote Chris’s blog on every sandwich bag in the store. See image below. This is absolutely fantastic and gutsy. Why gutsy? Because Chris gives an honest critique and says that some of their sandwiches are just plain bad. Why fantastic? Because the sandwich chain increased its popularity by embracing Chris’s efforts. Chris’s fellow coworkers and friends are now eating at the restaurant because of his blog. Heck, I’ve eaten there because of his blog! Also consider that Chris’s blog is somewhat popular and receives around 200 visitors a day. Imagine how many other people might be influenced by his reviews. Good job Which Wich on embracing blogging and word-of-mouth marketing. But don’t stop now. I suggest you see what else you can do to help promote Chris, thereby promoting yourselves.